My card arrived as well in the SPG dress as you mentioned. Is there anything that outlines the bonus eligibility for the Brilliant? Or the Bonvoy Biz card? I currently have an SPG Amex (Personal) that I received a 20k retention offer on and a Marriott Premier Plus (that I upgraded at EOY for 50k offer). Am I right that I am ineligible for any signup bonus on brilliant? Hard to keep track with changing names, multiple companies, etc. I don't think the website to apply is working. TPG and OMAAT both fail to open application pages. The direct amex page fails also. 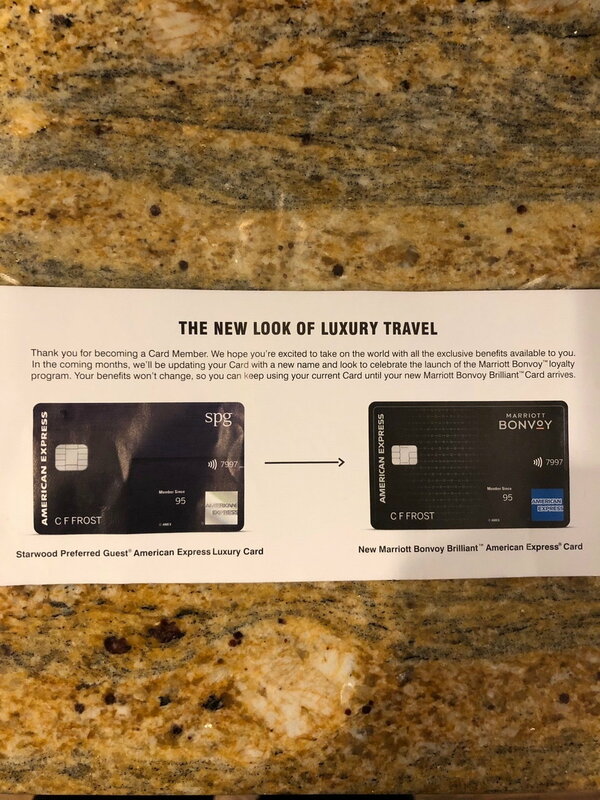 If you're upgrading you should login vs a direct link I think, to share my experience in case it helps others: after I saw the post on OMAT about the 100K point upgrade offer from SPG Amex (original, not Luxury) -> Bonvoy Brilliant card I immediately logged into my Amex account to see if I was targeted. I had an "offer" at the top of my account that was unrelated (a personal loan) I clicked the X to close that and refreshed and got a different offer related to adding authorized users, clicked the X and tried again and got the personal loan...I repeated this 3 times and figured I clearly was not targeted :sadpanda: Fast forward about an hour I logged back in and got yet another personal loan offer but after refreshing again lo and behold I had the Bonvoy Brilliant upgrade 100K offer after 5K in three months - clicked yes immediately! No idea if I was always to be targeted and it just had not been tagged the first time or if clearing out the other useless offers and logging out/back in had any effect but figured I post as a data point to not give up if you don't see the offer on the first (or third) try. additional data :I've had the SPG Amex for ~7 years I think (the memersince on my card has my Plat year and don't recall exactly when I got this one), I have only ever used it for SPG stays and used it 100% when staying at SPG hotels until last year when I got the Chase 100K offer on the Marriott Premier Plus card and moved all my Stariott spend to that. I don't think I'm an especially "good" customer for Amex as I've never given them a dime in interest but when I was using it as my primary SPG card did have pretty decent spend each year. When the SPG Lux card came out I tried many times to get that upgrade offer for that but never got one despite many login/out attempts. My renewal on the standard SPG amex was last month (Jan'19) I do hope/expect I'll still get the free night cert still for that as well. Net-Net I'll have recieved 200K Marriott points from Chase/Amex from signups since the conversion so I'm quite pleased with that. Personally I think the upgrade offer is an amazing value in that its not a new card/credit line and matches what Chase was offering for net new customers plus given the $300 credit the annual fee is really only $150 (you have no business considering this card if you're not spending WAY over $300 at a Marriott property) which is only $55 more than the SPG Amex AF I had and for that I get 100K bonus points plus the higher value free night which is worth considerably more than $55 IMO. At renewal I'll consider if I keep both Chase/Amex or drop one but given the free night certs more than pay for the fees I'm leaning towards keeping both. Thanks for posting it. In general I like to use imgur.com when posting pics. This may be a stupid question, but how quickly do bonus points post after hitting the minimum spend threshold ? Looking to book the St. Regis Rome in early April, and could get to the minimum spend by mid-March. Likewise and while thumbing through the leaflet I see no mention of the Luxury $100 Credit for booking at RC or StR properties. I decided to check the AMEX website and sure enough it’s not there but all of the Blogs mentioned it. Hopefully we will get the new metal cards soon with the full benefits that we were promised. The $100 RC and SR credit is on the Marriott website below. Coming March 28, 2019. The new, stainless-steel Card design will be available to new accounts in March 2019. Existing Card Members will automatically receive the new Card design starting in April 2019 and over the following months. This will mirror the Ritz Carlton J.P. Morgan card's existing $100 RC credit, though that card is also going to have St. Regis added as an option too starting in April 2019. One note: The $100 RC credit for the Ritz Carlton J.P. Morgan card ALWAYS requires bookings be made with fare code "Z34", so I imagine there be a similar requirement for this card. Anyone able to get the 100k upgrade offer, when they already have the card? (i.e have the Bonvoy Brilliant card and the regular Bonvoy card, but want to upgrade the Bonvoy card too). All times are GMT -6. The time now is 8:35 pm.